Shagbark hickory is a large (to 39 m), slow-growing, long-lived deciduous hardwood tree that is native to North America. It produces edible nuts that are consumed by humans and wildlife, and excellent fuel and wood products. C. ovata is distinguished from all other Carya species by the presence of dense tufts of hairs at the tips of the serrations of leaves. Winter buds of C. ovata have conspicuous and persistent dark outer bud scales over the tan, teardrop shaped bud. Shoots are stout with prominent lenticels and are bulged at the bud scar marking the current season's growth. 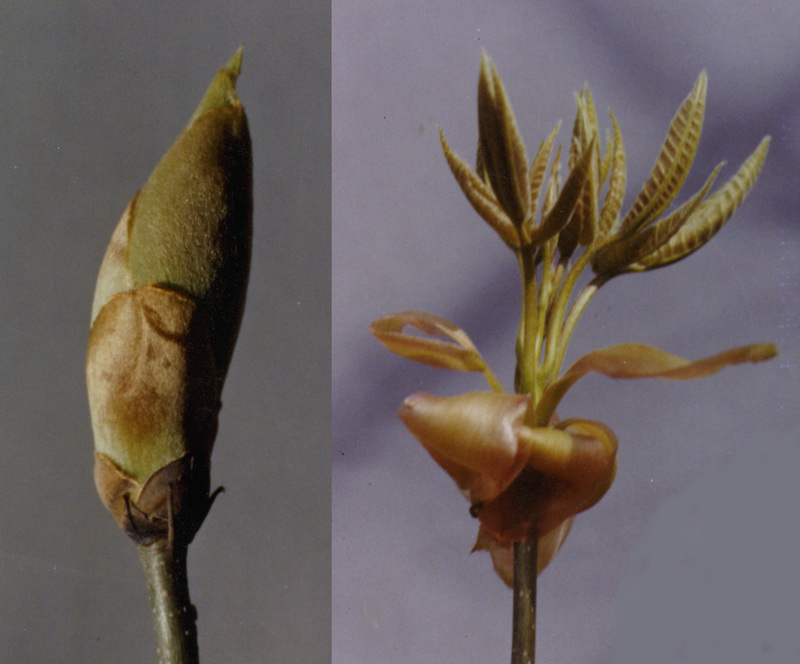 Buds are accresant, and swell greatly as growth begins in the spring. The fruit of C. ovata is prominently 4-angled, with the sutures of the husk occurring at the corners of the angles. Shucks are smooth, thick (5-8 mm) and turn rich brown before dehiscing. Nuts are 4-angled, cream colored, thick shelled and have sweet kernels. The bark of young trees is light gray and smooth, but exfoliates in long loose plates on mature trees, giving the tree its common name. There are three noteworthy varieties of Carya ovata: the autonym var. ovata, var. carolinae-septentrionalis (Ashe) Reveal, and var. mexicana (Manning). Carya ovata var. carolinae-septentrionalis (= C. ovata var. australis (Ashe) Little) has more slender shoots and darker outer bud scales than var. ovata. Hardin and Stone (1984) observed small round scales in var. ovata which were absent from var. carolinae-septentrionalis and considered that the best leaf characteristic for differentiating the two. C. ovata var. mexicana was described in detail by Manning (1949) who noted that the "Mexican trees are difficult to separate even as a variety". In general, the shell or internal partitions of the shell are thick, the shell is often only slightly angled, and the husk may be thinner than typical C. ovata, distinguishing the Mexican shagbark hickory as a geographical variety. Some authors also recognize C. ovata variety pubescens, on the basis of extremely dense pubescence on lower leaf surface and twigs, giving the tree the appearance of C. tomentosa. 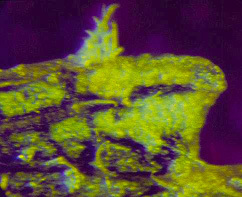 Close observation of the tips of the serrations will reveal tufts of hairs characteristic of C. ovata. There has been at least one named cultivar of this form; 'Kentucky'. 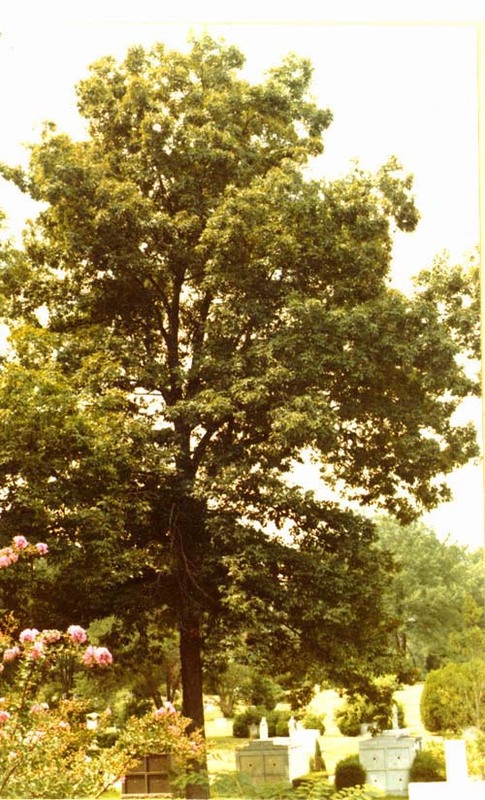 There are over 130 named cultivars of C. ovata, more than for any other hickory except pecan. Most of the shagbark "cultivars" have not been propagated and may not be worthy of propagation, but are given names in recognition of their selection for nut production. Most of the named cultivars have originated in Iowa, New York, or Ohio, although 22 states and Canada are represented. Among the most popular current cultivars are 'Yoder', 'Porter', and 'Wilcox'. The diploid shagbark hickory hybridizes with the diploid shellbark hickory [Carya laciniosa (F. Michx.) Loudon] to produce C. X dunbarii Sarg. Several cultivars of this hybrid have been named, including 'Abundance' and 'Weiker'. Carya ovata hybridizes with the diploid bitternut [Carya cordiformis (Wangenh.) K. Koch] to produce C. X laneyi Sarg. Hybrids between shagbark hickory and pecan have been found in the United States and Mexico. Named hybrids of that cross include 'Burton', 'Henke', 'Pixley', and 'Wapello'. Carya ovata has also been reported to hybridize with the tetraploid C. tomentosa. Shagbark hickory is found in all of the southeastern United States except Florida, extending into the eastern portions of Texas, Oklahoma, Kansas and Nebraska. It does not grow on the southeastern and Gulf coastal plains or the lower Mississippi Delta. In the north, it occurs from Maine west to southeastern Minnesota, with the northern&SHY;most extensions of the range being into Quebec, Canada along the St Lawrence River. The species has a disjunct distribution, with isolated populations of variety mexicana occurring in the mountains of Mexico as far south as Puebla (distribution map). Within the natural range of shagbark, average annual temperatures range from 4 C in Quebec, Canada to 22 C at Monterrey, Nuevo Leon, Mexico. The extreme cold temperature recorded within the native range of shagbark was -31 C, in Quebec, Canada. In Veracruz, Mexico, shagbark hickory occurs at elevations up to 1800 meters. The mean annual rainfall varies from 605 mm at Monterrey, Mexico, to over 2000 mm in the mountains of North Carolina. Rainfall in the Monterrey area is in a distinct summer rainy season, while most of the range receives rain throughout the year. In the North, shagbark hickory is found on sloping upland sites, often in association with oaks and various mixed upland hardwoods. In the Ohio Valley, Cumberland Mountains, and Blue Ridge Mountains of the Carolinas, shagbark is chiefly found on north and east-facing slopes. 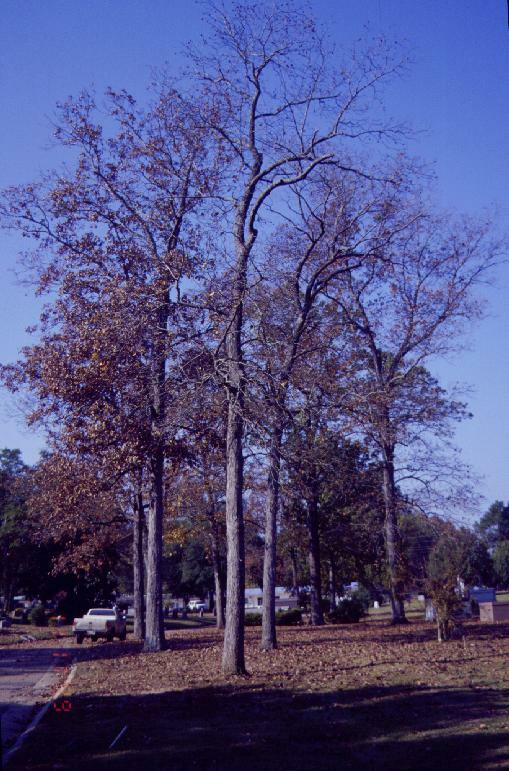 In Arkansas, Louisiana and Mississippi, shagbark hickory generally occurs on moist soils of alluvial origin. In Mexico, it is found on relatively steep, rocky slopes. The range of shagbark hickory encompasses 7 soil orders and 14 suborders, with Ultisols being the dominant upland soil in the southern half of the range, and Alfisols and Mollisols being the primary soil orders in the northern portion of the range. Carya ovata var. 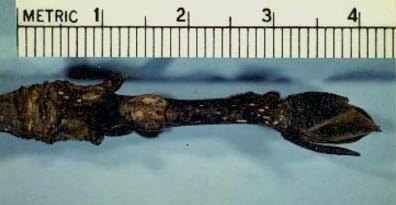 carolinae-septentrionalis generally occurs on sites having a more shallow surface soil and higher pH than does C. ovata var. ovata. C. ovata is a minor component in six forest cover types: Bur Oak (Society of American Foresters Type 42), Chestnut Oak (Type 44), white Oak-Black Oak- Northern Red Oak (Type 52), Pin Oak-Sweetgum (Type 65), Loblolly Pine-Hardwood (Type 82), and Swamp Chestnut Oak-Cherrybark Oak (Type 91). It is also a probable associate in the Eastern White Pine (Type 21), Beech-Sugar Maple (Type 60), White Oak (Type 53) and Northern Red Oak (Type 55) cover types. Trees reach commercial seed-bearing age in the forest at about 40 years, with maximum seed production from 60 to 200 years. Under appropriate management, seedlings may bear in 10 to 15 years, and grafted trees may bear in as few as 3 to 4 years. Yields vary tremendously with age and site. The best yielding trees in cultivar tests may produce up to 75 lbs. of nuts on 25 year-old trees. Nut weight varies from about 3 g to over 12 g per nut (150 nuts/lb. to 38 nuts/lb.). The majority of the nut weight is in shell, with the kernel typically accounting for less than 30% of the weight. Outstanding trees have been selected with up to 47% kernel ('Porter'). Internal shell configuration varies greatly, with kernels on some trees being bound by internal convolutions of the shell, while others produce kernels that easily separate from the shell ('Wilcox'). As with most hickory species, early nut maturation is attended by severe animal depredation. Seeds have embryo dormancy that is overcome naturally by over-wintering in moist, cool leaf litter or in underground caches of squirrels. Commercially, seed is stratified in moist medium at about 3C (37 F) for 90 to 120 days. Seed collected from the northern portion of the range requires longer stratification for optimum germination than seed collected from more southerly sources. Germination rates of 50 to 75% are typical. Germination is hypogeal, with initial growth being concentrated in the production of a long taproot. As a result of the excellent anchorage afforded by the taproot, shagbark hickory is rated as wind resistant on most sites. Shagbark hickory produces prolific sprouts from cut or fire-killed stands with diameters up to 20 to 24 cm. As stump diameters increase stump sprouting decreases and root sprouting increases. The thin bark of young to medium aged trees makes them especially susceptible to damage by fire. Short fire intervals tend to reduce shagbark and favor oak. Hickory wood in general is quite dense, contributing to its value as a fuelwood. Hickory wood furnishes about 25 million BTUs per cord. The wood of shagbark hickory is among the most dense in the genus, with an average specific gravity of 0.72. Pignut hickory (C. glabra), pecan (C. illinoinensis), and nutmeg hickory (C. myristiciformis) have average specific gravity of 0.75, 0.66, and 0.60, respectively. The sapwood (often sold as 'white hickory') is cream to white in color and is preferred over the heartwood, which is pink or red to brown (known in commerce as 'red hickory'. The wood has high toughness, bending, stiffness, and crushing strengths, and has exceptional shock resistance. It submits well to steam bending, is generally difficult to machine, and has a moderate blunting effect on tools. Although difficult to glue, it stains and polishes very well. The wood is considered non-durable, with sapwood being liable to attack by the powder post beetle and heartwood being moderately resistant to preservation treatment. Hickory wood is ideal for handles of striking tools such as hammers, picks and axes. It is used for chairs and as ladder rungs. Hickory wood is used extensively for sports equipment such as golf clubs, lacrosse sticks, baseball bats, longbows, and for laminae in racquets and skis. The wood is used for plywood faces and is sliced for decorative veneers. Strips of inner hickory bark are pliable when green, and can be woven to make chair seats. "Though these are natives of the forest, yet they thrive better, and are more fruitful, in cultivated plantations, and the fruit is in great estimation with the present generation of Indians, particularly juglans exaltata, commonly called shell&SHY;barked hiccory*. The Creeks store up the last in their towns. I have seen above an hundred bushels of these nuts belonging to one family. They pound them to pieces, and then cast them into boiling water, which, after passing through fine strainers, preserves the most oily part of the liquid; this they call by a name which signifies hiccory milk; it is as sweet and rich as fresh cream, and is an ingredient is most of their cookery, especially homony and corn cakes"
Sargent suggested that Juglans exaltata is a synonym of C. alba Nutt. (=C. ovata (Mill.) K. Koch). "Shellbark hickory" was used for C. ovata (Mill.) K. Koch during Bartram's time, rather than for C. laciniosa as is current. C. ovata is more widely distributed in northern Georgia than is C. laciniosa. It is probable that Bartram was referring to C. ovata. 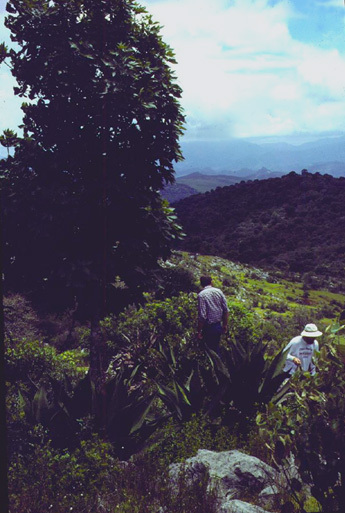 Bringhurst (1983) outlined 4 steps usually followed in the development of improved fruit crops from wild species. First, superior phenotypes are identified in natural populations. Second, the best selections are propagated in an agricultural setting. Third cultural practices are developed that enhance performance of selected cultivars. Finally, the best selections are crossed pollinated, followed by selection of superior offspring (which are used as parents for further crosses). Despite their long history of utilization, the shagbark hickory is still at an early stage of crop development. Many "superior phenotypes" have been found in native populations, with nut characteristics being the primary basis of evaluation. The characteristics and performance of these "cultivars" following asexual propagation has been the focus of much attention in the horticultural literature. Unfortunately, such horticultural observations are often based on one tree of a cultivar, often with a rootstock of another species and growing on mediocre sites. We need to integrate nut selection with selection for improved wood production (requiring insect and disease resistance for both), within the context of geographically and edaphically adapted populations grown under realistic cultural systems.